If you are just joining this 12-part series, you may want to refer back to previous posts about other personas that can lead to workplace toxicity. We’ve already examined the behaviors of Scrambler, Dinosaur, Climber, One-Hit Wonder, Intimidator, High & Mighty, and Lone Wolf styles. All told, we’ll cover 12 different types of behaviors and attitudes that can derail your career. Usually, these show up early but get ignored. They become blind spots. The longer you wait to work on them, the harder it is to adjust. What makes it even more difficult to identify these career roadblocks and blind spots is that they usually start out as strengths. The very same behaviors have served you well in the past. They might even be part of your identity. Seeing them as detrimental to yourself or others will not be easy. Try to consider the information presented in this series objectively. This is not about “throwing the baby out with the bath water.” It’s about understanding the difference between positive and negative effects. And it’s all a matter of individual choice. Warning Signs of Toxic Leadership: Are You The Nuclear Reactor? It’s been building for a while, and you just lost your cool. You had an emotional outburst. It may have been angry and explosive. Or it may have been a subtle, quiet eruption, and now you’re sullen and withdrawn. Either way, people know that now is not a good time to approach you. Seems unable or unwilling to control emotional outbursts and reactions to difficult situations. Can’t handle the pressure. Snaps or flies off the handle without much warning. Uses emotions to gain sympathy or convey needs that could have been addressed in other ways. Allows emotions to interfere with work performance and workplace relationships. 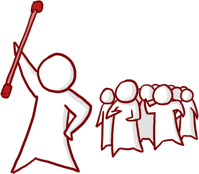 You want others to understand that you’ve reached your outer limits of tolerance or workload. It seems like no one understands just how much pressure you’ve been under. You’re seeking comfort and sympathy from others. Others seem to be taking advantage of you or expecting more than you are able to deliver. You’ve exhausted alternatives for trying to communicate about the stress you’re experiencing. Maybe this persona isn’t who you really are. It’s not who you intend to be. It feels unfair to be labeled this way. Nonetheless, if people see you as The Nuclear Reactor, something caused them to see you this way. For them, this is real. What Can I Do if I might be The Nuclear Reactor? If you are, indeed, The Nuclear Reactor, here are some immediate actions you can take to change others’ perceptions and exhibit these behaviors less frequently. Find ways to relieve the pressure gradually instead of letting it build up to an explosion. View constructive feedback as others’ attempts to support and help, not hurt, you. Pause and decide whether you’d rather be emotional or effective in a given situation. Take space. When you feel stressed, pull back instead of getting enmeshed in unhealthy ways. If you’re wondering whether or not it’s worth it to make these changes, you should know that there is an impact to being perceived as The Nuclear Reactor. Failure to control emotions in the workplace can impact people you work with. 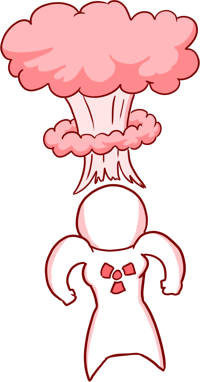 The biggest risk you take when you allow Nuclear Reactor behaviors to go unchecked is that people may see you as unable to control yourself. This anger in the workplace causes them to think you can’t be trusted to control situations or to take on larger responsibilities. Each meltdown diminishes their confidence in you. Some may also view your emotional outbursts as manipulative attempts to gain sympathy or attention. Since it appears that your emotions boil over without warning, they assume you can turn them off and on. They may think you’re using emotions to deflect attention away from poor performance or to look like the victim in any interpersonal conflict. Those who prefer a logical and calm manner may lose respect for you. You also run the risk of losing relationships. One day you seem to be taking things in stride, but the very next day you are a powder keg. When people see you as volatile, they retreat for self-preservation. This choice is yours. Choosing to deny, ignore or embrace your Career Roadblock characteristics are all legitimate choices. You don’t have to change a thing. 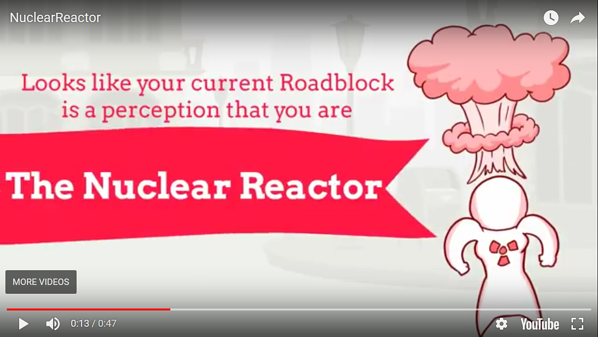 The Nuclear Reactor is one of 12 behavior sets that can become career roadblocks. When others are observing the issues with someone who is stuck and has these blind spots, they frequently use terms to describe these roadblocks (e.g. “control freak” or “dinosaur”).